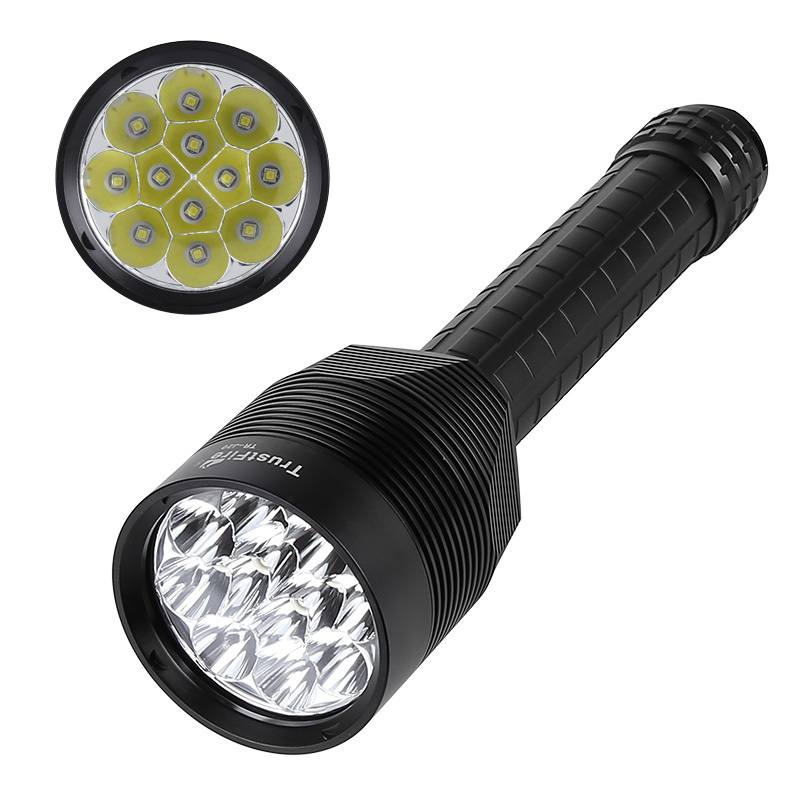 Successfully Added LED Flashlight - 13000 Lumen, Reinforced Glass Lens, Aluminum Alloy Body, 5 Light Modes, 12x CREE XM-L T6 LEDs to your Shopping Cart. With this massive LED flashlight at your side, you’ll never have to be afraid of being left in the dark again. This powerful flashlight features 12 CREE XM-L T6 LEDs. These lights put forth a stunning 13000 lumens of light. With all this power at your side, you’ll be able to light up the entire road ahead. The light itself features an extremely tough design as it has been crafted out of high-end aluminum alloy. It weighs a whopping 1.6KG and comes with a reinforced glass lens. Therefore, you won’t have to worry about accidentally breaking this little beauty. Its powerful LED and tough body make this CREE flashlight particularly handy to be used in emergency situations. This CREE LED flashlight is powered by three 26650 batteries. These cells treat you to enough juice to get you through the longest of nights. With its five different lighting modes, this LED flashlight can be used in any sort of environment and situation. It even features an SOS light mode that allows you to signal people nearby in the case of an emergency. This massive LED flashlight is a great asset to your emergency kit and is great to be used by security guards or firemen. With this massive flashlight at your side, you’ll be able to light up all that lies ahead no matter the situation. This CREE flashlight comes with a 12 months warranty, brought to you by the leader in electronic devices as well as wholesale electronic gadgets..